Endpoints are primary targets for cyber criminals. Traditional endpoints such as laptops, tablets, and smartphones support agents and can be centrally managed, configured, and protected. The Internet of Things will drive 4 times the volume of unmanaged devices on a network increasing the attack surface and creating welcome mats for unwanted threats. These unmanaged IP-based devices will be difficult to identify, unable to support an agent, and look like black boxes to security professionals. Without knowing the device type and its business criticality, containing a compromised endpoint will be challenging and time consuming. As the volume and diversity of mobile devices on your network continue to rise, so does the need to ensure that every device is safe. Cybercriminals leverage vulnerable endpoints as backdoors to the network and according to Gartner "by 2017, the focus of mobile breaches will shift to tablets and smartphones from workstations." As the attack surface of your network continues to multiply with each new device, network access control is essential to securing your assets and critical infrastructure. Today’s cyber threats are targeted, difficult to detect, and require expertise to contain. They traverse various domains of IT management — making incident response a time consuming and cross-functional challenge. Silos of security and network information require correlation to trace the security events to the compromised endpoints. Moreover, the increasing volume of security events makes it impractical to prioritize, respond and contain threats manually. This webinar is an introduction to Network Sentry/RTR -- a solution that can correlate high fidelity security events with new contextual information to prioritize, simplify, and accelerate incident response. Today’s cyber threats are targeted, difficult to detect, and require significant manual intervention and expertise to contain. They traverse different domains of IT management — making it a cross-functional challenge to trace and find the threat’s electronic foothold. Silos of security information require manual correlation to bridge the gap between security event alerts and endpoints infected with zero-day malware. Moreover, the increasing volume of security events that need to be triaged makes it impractical to respond and remediate threats manually. Join this session to understand how to reduce threat response time from 7 days to 7 seconds. Fortinet and Bradford Networks have partnered together with a solution that correlates high fidelity security alerts with contextual information on threats on compromised end-points in real-time, reducing threat containment time from days to seconds. This webinar draws on Bradford Networks’ extensive BYOD experience to help organizations avoid the landmines that plague BYOD initiatives. Join this webinar to understand how to reduce threat response time from days to seconds. Bradford Network's Network Sentry/RTR correlates high fidelity security alerts from Check Point Software's Next Generation Firewall and Threat Prevention solutions to identify and contain threats on compromised end-points in real-time. In this webinar, you will learn about the integration between the two solutions and how it’s used to contain compromised endpoints. Many hospitals and medical centers are embracing tablets to improve the quality of patient care. With this new mobility, securing Electronic Medical Records (EMR) and demonstrating HIPAA compliance has created new challenges. This high-impact webcast will present a proven approach to enabling medical staff to leverage their mobile device of choice while protecting EMR and maintaining compliance. Today’s cyber threats are targeted, difficult to detect, and require significant manual intervention and expertise to contain. They traverse different domains of IT management -- making it a cross-functional challenge to trace and find the threat’s electronic foothold. Silos of security information require manual correlation to bridge the gap between security event alerts and endpoints infected with zero-day malware. Moreover, the increasing volume of security events that need to be triaged makes it impractical to respond and remediate threats manually. Join this session to understand how to reduce threat response time from 7 days to 7 seconds. Leveraging integration with FireEye, Bradford Networks correlates high fidelity security alerts to identify and contain threats on compromised end-points in real-time. Knowing what’s connecting to your network is fundamental to regulatory compliance as well as security best practices. The right Network Access Control solution can provide state agencies and local governments with real-time visibility and automated control over every attempted connection to the network. Please join us for this webinar that will provide best practices for securing a network and addressing compliance within state agencies and local governments. Join this session to understand how to reduce threat response time from 7 days to 7 seconds. Leveraging integration with Palo Alto Networks, Bradford Networks correlates high fidelity security alerts to identify and contain threats on compromised end-points in real-time. Retail organizations, even when PCI DSS compliant, must remain diligent about safeguarding their networks and access to cardholder data. Given that retail networks are public facing with wired and wireless network access within reach of the general public as well as employees, retail IT professionals must ensure the integrity of their cardholder networks and the devices that are connected to them. The cyber world is so vast and interconnected, and cyber criminals are so cunning in finding weaknesses to exploit it, that you’re almost certain to get hacked at some point. Silos of security information require manual correlation to bridge the gap between security event alerts and endpoints infected with zero-day malware. Moreover, the increasing volume of security events that need to be triaged makes it impractical to respond and remediate threats manually. Join this webinar to learn about building a five-step process to identify and contain threats on compromised end-points – and cut the threat response time from days to seconds and lessen a threat’s impact. When the unthinkable happens, knowing how to leverage the inherent intelligence in your network and a high degree of automation will let you respond quickly and effectively to minimize the damage. Each year, thousands of students, faculty, and staff converge on your campus network bringing their laptops, iPads, smartphones and other mobile devices with them, and they all want wired and wireless network access. Primary and secondary schools are embracing personal mobile devices to enhance the learning process. Some schools allow students to bring their own device (BYOD) while others fund the device for each student (1-to-1). To avoid a barrage of help desk calls, IT staff are looking for simple, secure, and cost effective ways to embrace BYOD. The goal is to ensure students, faculty, and staff get to use their device of choice while access to sensitive information and the internet is carefully managed. Bradford Networks is the leading provider of rapid threat response solutions that minimize the risk and impact of cyber threats. The Company’s patented Network Sentry solution enables Cyber Security Teams to continuously assess the risk of every user and endpoint on the network, and automatically remove vulnerable and compromised devices that act as backdoors for cyber criminals. Our channel provides you with the latest information about how to minimize the risk and impact of cyber threats. 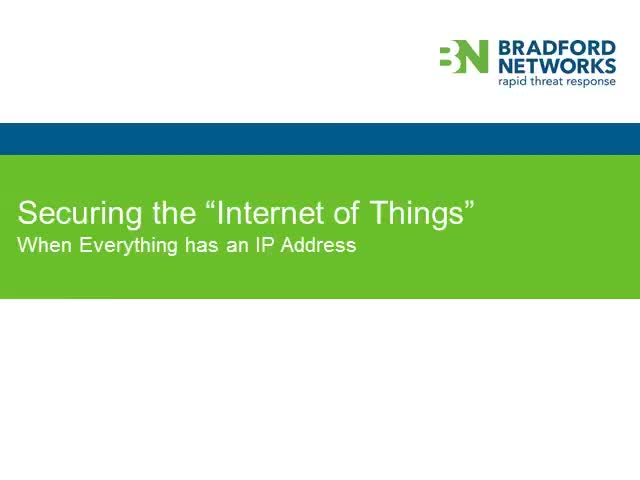 Our webcasts include industry news and trends, as well as information about products and services from Bradford Networks and our technology partners.